What a great shot of the NHRA Mello Yello Drag Racing Series Pro Stock cars fielded by the Summit Racing Equipment race team. 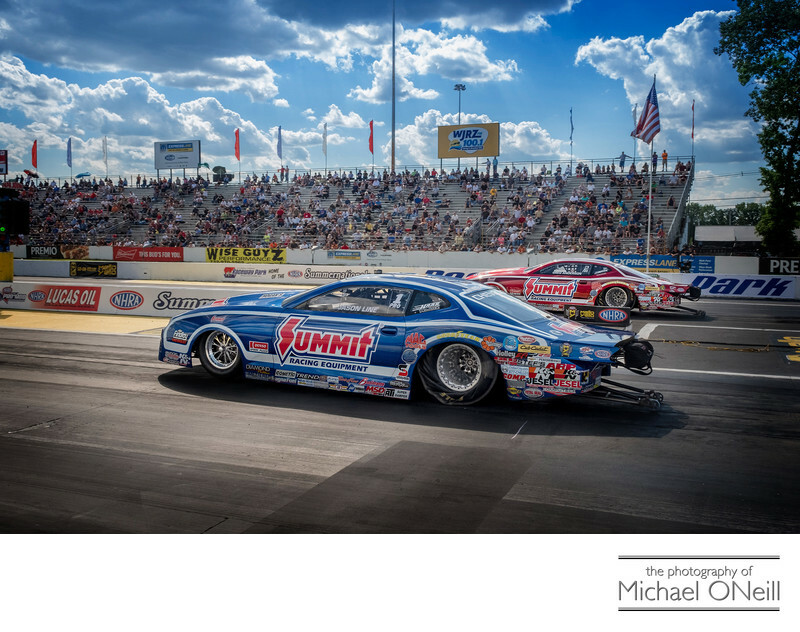 Here Jason Line (the blue car) and Greg Anderson (the red car)…team mates…face off against each other in a semifinal qualifying round during The NHRA Summernationals, held every year at the legendary Raceway Park in Englishtown, NJ. This is a great photograph of an exceptional race team. The only downside is that one of these cars will go on to compete in the final rounds while the other car will get loaded back on to it’s hauler…it’s racing finished for the weekend through elimination. The Summit Racing Equipment race team is one of the most successful in NHRA Pro Stock racing. What a perfect advertising platform team sponsorship in NHRA racing is. The fans are loyal and line up to purchase your goods and services when you sponsor a race team. This is not exclusive to the NHRA either. Race fans are recognized as some of the most ferociously devoted, loyal fans in any sport and go out of their way to spend their hard earned dollars with the company that brings their favorite sport to them. NASCAR, Indy Car, Formula 1, IMSA WeatherTech, Pirelli World Challenge, MotoGP, MotoAmerica, Monster Jam, The Championship Cup Series and other sanctioning bodies all offer great advertising opportunities to race team sponsors. Many of my racing assignments come directly from various different motorsports magazines retaining me to cover a particular event in my area of the country (Northeast and Mid-Atlantic US). I have been hired to create photos that will accompany an editorial in an upcoming issue. I have also been retained for deadline work where, at the end of any given race, I’m back at the track’s media center uploading images instantly to my editor for immediate release on the sports news reporting sites. Some of my favorite assignments, however, come when I am hired by a race team’s sponsor to create advertising or public relations photographs. These assignments don’t offer the same amount of creative freedom that exists in editorial work. Often I am "shooting into a tight comp"…creating the picture that has already been drawn into a proposed advertising layout that has been approved by the client. I call this image "Red, White and Blue" for obvious reasons. There’s just something about these two colorful cars, the graphics on the race track, the American flag and the puffy white clouds in the deep blue sky that just screams patriotism.